Synopsis: Sacrifice, like death, is one of the great taboos of modern society. The notion that human sacrifice, and even cannibalism, could be considered a most holy act is almost inconceivable. Yet the evidence for human sacrifice in northwest Europe, deriving from both archaeology and the testimony of Classical writers of the first centuries BC and AD, has to be confronted. Professor Green puts forward some reasons for ritual murder and shows how the multiple deposits of bog-bodies at sites like Tollund and Lindow illustrate the importance of place in the sacrificial rite. She also highlights the essential role of the priesthood in sacrificial murder. The aim of this book is to look at the evidence for human sacrifice in the ancient European Iron Age and the Roman period. The areas covered, for the most part, are north and west of Europe and that includes Britain. The time period discussed is from around 600 BCE to AD 400. In the Prologue Green makes sure to discuss her sources and the problems that each source present in interpretation. She also discusses how modern distaste for human sacrifice can shape our thoughts concerning it and how others that accept it blindly are also doing themselves a disservice considering that the material available is not clear cut. I really found chapter one interesting. It discusses what the nature and function of human sacrifice is and what it originally meant as well as what it meant in European antiquity. Human sacrifice is introduced in this chapter. Chapter two has the following themes: Human and Animal sacrifice and how they are different than inanimate offerings, and the discussion of how animals and humans are similar when sacrificed, sacred violence, and ritual cannibalism. The themes were interesting to read about, especially since to my mind it relates to what is a sacrifice and what is an offering. The third and fourth chapters are a discussion of fire and blood rites.The author dedicates a chapter for each and discusses sacred fire, the wicker man, fire sacrifices, and blood sacrifices (human). Chapter five is all about head hunting and the ritualistic significance of that practice. Chapters six, seven and eight discuss some of the ways of ritual killing and the way that victims are chosen and some of the reasons for ritual murder. Chapter nine discusses the people who perform the sacrifices . Each one of these chapters had something interesting to say, I found the archaeological evidence presented interesting. As a whole the book does a good job of fulfilling its aim of looking at evidence of human sacrifice. There is enough evidence there to convince the people who are not convinced yet. I think however, for me, the most important chapters were not about who was doing the sacrificing, who was sacrificed or the way it was done. What was most important to me were the Prologue that discussed the sources and what needs to be set aside for us to even look at the issue of Human sacrifice, the first chapter which discusses the nature and function of human sacrifice and gives the different definitions, and finally the parts in all the other chapters that discussed or made the distinction between sacrifice and offerings. For the most part a good book to add to the home library. 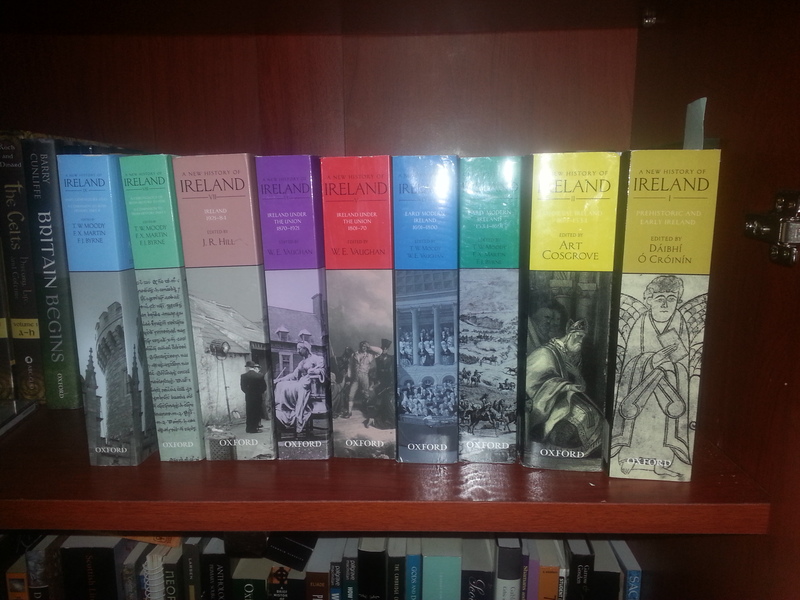 In this review I will be discussing a whole series made up of 9 volumes called A New History of Ireland. Some of the volumes will be out of order because they are actually a companion to one of the other volumes. The series covers Irish history from prehistoric times to 1984. The antiquity and thoroughness of the process by which land was cleared and given a shape designed for human needs, as well as the fluctuations in the extent and intensity of agriculture. The origins of Celtic Ireland. The organization of the Church AD 650 – to 1150. This volume is edited by Dáibhí Ó Cróinín. First published in 2005 then reprinted in 2008. **Some of these chapters were written in the 1960s and 1970s, and so they reflect the direction of research rather than the lates research. Volume II Medieval Ireland 1169 – 1534): The period discussed in this volume starts with the coming of the Normans and it ends with the rebellion of 1534. Basically, two nations and their interactions that form the complex history of Ireland. **This is a very interesting volume that sets the stage for the history that is yet to come, and REALLY begins to explain the struggles that are coming. This volume is edited by Art Cosgrove. First published in 1987 then reprinted in 1993 and 2008. Volume III Early Modern Ireland 1534 – 1691: This volume actually came out before volumes I and II. In this volume we see the English completely taking over Ireland. The period discussed in this volume starts with the unsuccessful rebellion of Thomas Fitzgerald in 1534 and ends with the Treaty of Limerick in 1691. This volume also discusses the Irish language, literature, the Irish abroad and even the English language in early modern Ireland. This volume is edited by T.W. Moody, F.X. Martin, and F.J. Byrne. First published in 1976 then reprinted in 1987, 1993, 2009, 2012. Volume IV Eighteenth-century Ireland (1691 – 1800): This volume discusses a well marked period in Irish history that starts with the Treaty of Limerick and ends with the parliamentary union. This was the period where the protestant minority reached its height in the political, economic and social arena. This volume also discusses Irish language and literature, Irish literature in English, the visual arts and music. It also has a chapter on the migrations to the continent of Europe. This volume is edited by T.W. Moody, and W.E. Vaughan. First published in 1986 then reprinted in 2009. Volume V Ireland Under the Union (1801 – 1870): This volume discusses the first part of Ireland under the Union. The Union was enforced on January 1st, 1801 but by the end of 1870 there were a lot of things that undermined it. These include the Land Act of 1870, the Church act of 1869, and the foundation of the Home Government Association. This was the period of direct rule by Britain of Ireland. This volume is edited by W.E. Vaughan. First published in 1989 then reprinted in 2010. Volume VI Ireland Under the Union (1870 – 1921): This volume discusses the second part of Ireland under the Union. It completes the coverage of Ireland under the Union. This is one of the more interesting volumes to me. I heard a lot of stories and read a lot of books on this period, but none of the stories have actually explained it as well as this volume. This volume is edited by W.E. Vaughan. First published in 1989 then reprinted in 2010, 2012. Volume VII Ireland (1920 – 1984): This volume gives an outline of the division of Ireland and the eventual birth of the Irish Republic. It also gives us a comprehensive at the political developments in the north and the south. It also gives us chapters on the economy, literature in English and Irish, the Irish language, the visual arts, emigration and immigration, and the history of women. This volume is edited by J.R. Hill. First published in 2003 and reprinted in 2010. Volume VIII (A Chronology of Irish History to 1976 – A Companion to Irish History, Part I): The chronology here encompasses all of the volumes. The editors attempted to give us a chart of events in the history of Ireland from the earliest times to 1976. It aimed to cover all of the social spectrum but of course politics has a major part of this chronology. The book is divided into phases that correspond to the volumes of the New History of Ireland. Every entry is based on either a primary source or a reliable secondary one. This as far as I know was never done before and if it was, it was not done to this extent. **If you don’t get any of the other volumes get this one. This volume is edited by T.W. Moody, F.X. Martin, and F.J. Byrne. First published in 1989 then reprinted in 2011. Volume IX Maps, Genealogies, Lists – A Companion to Irish History, Part II: This volume is amazing. Full of interesting information that you probably won’t get all in one place. For any researcher this is a treasure trove. MY VERDICTED: I think you need to pick and choose which volumes you want to get depending on the subject matter you are interested in, for me all of them were relevant. If you want my advice and have a limited budget I suggest you get the last two volumes and read the rest in the library. I loved the series and see myself going back to it time and again when conducting research (with some cross referencing for updated ideas and such of course).